New York City is a place of constant change, invention and chaos. 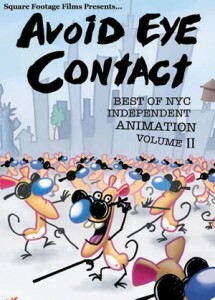 Avoid Eye Contact 2 sums up these urban qualities in animated terms and continues to explore the thriving independent scene going on in New York City. The films on this volume span the last five years – young animators join seasoned masters in a program that is sure to become an important part of any animation enthusiast’s library. All films are international award winners, each with a distinct look, united only by genre and the gritty soul of New York City. Features films by Bill Plympton, Mo Willems, Patrick Smith, John Dilworth, Signe Baumane, Michael Overbeck, Chris Conforti, Rohitash Rao, Nina Paley, Fran Krause, Christy Karacas, and PES.